IBT now offers a complete solution for real-time reporting and business intelligence for all PeopleSoft applications, be it Financials, HCM, CRM or Campus Solutions. Up to now, data warehouse data used for the creation of reports and BI was only refreshed periodically (daily or weekly) which meant that more recent transactions would be omitted. Using Attunity Replicate new transactions in PeopleSoft applications are instantly moved into the data warehouse and are available in BI reports. Attunity Replicate effectively facilitates the movement of incremental changes via innovative and powerful TurboStream CDC, a log-based change data capture (CDC) technology, which streams high volumes of transactional changes captured from the source databases to the data warehouse with very low impact on the source. 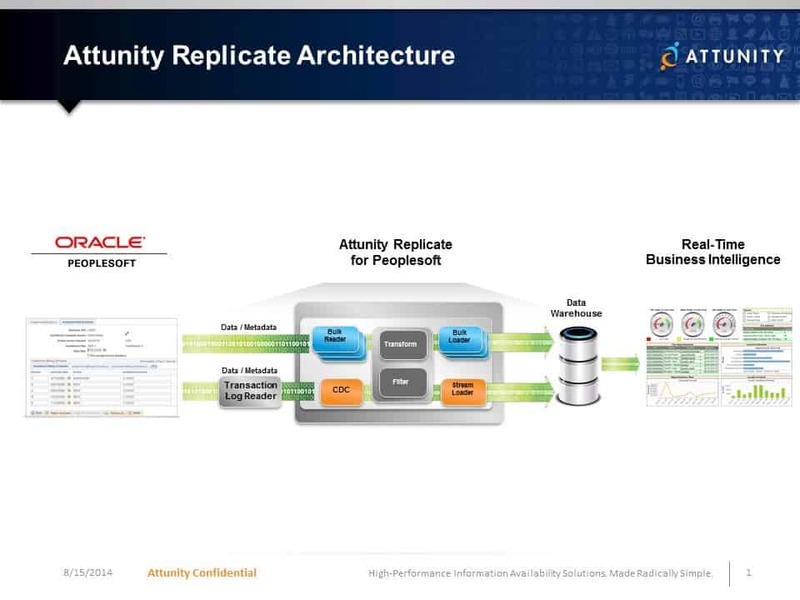 More generally, Attunity Replicate enables operational data stores (ODS) or data warehouses by providing high-performance, end-to-end data loading with quick time-to-value. The Attunity solution empowers PeopleSoft customers to quickly load PeopleSoft data, as well as data from other heterogeneous data sources, and then maintain the changed data continuously and efficiently.